This Edition is now sold out! If you are interested in obtaining this print on the secondary market please contact us and we will notify you should one become available. Please note however that secondary market prints are highly collectable and their value may be considerably higher than the original issue price. 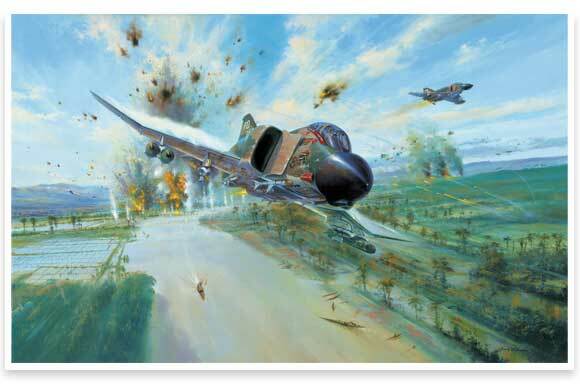 Simon Atack’s powerful new limited edition depicting the high-speed, low-level attack by F4 Phantoms of the 435th Tactical Fighter Squadron on the bridge near Viet Tri, 24 May 1967. Just 50 miles north-west of Hanoi in North Vietnam, lies the long and winding valley of the infamous Red River - a name that was to become bitterly familiar to the F4U Phantom pilots of the 8th Tactical Fighter Wing, Flowing for miles through the country's deep interior, the waters of the Red River fed the strategically important steel mills at Thai Nguyen, and the power stations at Viet Tri, they also irrigated the rice and shrimp paddy fields that fed the armies of the North Vietnamese and Vietcong, distributed to the combat areas through a sophisticated network of hidden trails and tracks, bridges and railways. Defending these vitally important targets was a vast array of anti-aircraft systems of every conceivable type and calibre; at Yen Bai the North Vietnamese even established a secret fighter airfield where their Mig jet fighters were hidden in hangers dug by hand deep into the surrounding hills - in short it was one of the most heavily defended and awesome places on Earth. But these targets had to be destroyed, and one aircraft above all others became inextricably and forever linked with the fast, low-level jet attacks to obliterate these heavily fortified objectives - the legendary F4U Phantom, the fastest, most powerful, versatile fighter of the day. The bravery and determination of the Phantom crews as they flew into the maelstroms of intense, deadly flak and ground fire remain an inspiration to all ground- attack combat pilots and crew. Simon Atack's collector limited edition portrays one such awe-inspiring attack. In May 1967 Operation Linebacker was launched, its objective - the complete and utter destruction of the North Vietnamese Army's means of supply. Everything was to be hit - roads and railways, and especially bridges that carried vital supplies south through the DMZ to the fighting areas. On 24 May the Phantom pilots of the 435th TFS, the Eagles, part of the 8th Tactical Fighter Wing based at RTAFB Ubon, attacked the North Vietnamese bridge at Viet Tri. Simon has brilliantly captured the hair-raising moment as F4U or Eagle Eye and other Phantoms of the 435th TFS hurtle away from the attack area, whilst behind them the air is filled with shell bursts, coloured tracer, dense smoke and thunderous explosions, creating terror and panic with the defenders. With each print in this outstanding edition individually signed by legendary fighter Ace Robin Olds, who commanded the 8th Tactical Fighter Wing at Ubon, and who after scoring 24 victories during World War II, achieved another 4 flying the F4 Phantom in Vietnam, these prints are sure to become highly sought after, and treasured for years to come. On 24 May 1967 the Phantom pilots of the 435th TFS, the Eagles, part of the 8th Tactical Fighter Wing based at RTAFB Ubon, attacked the North Vietnamese bridge at Viet Tri. Portrayed is F4 Eagle Eye and other Phantoms of the 435th TFS as they hurtle away from the attack area, whilst behind them the air is filled with shell bursts, coloured tracer, dense smoke and thunderous explosions, creating terror and panic among the defenders. Signed by legendary fighter Ace Robin Olds, who commanded the 8th Tactical Fighter Wing at Ubon, and who after scoring 24 victories during World War II, achieved another 4 flying the F4 Phantom in Vietnam.